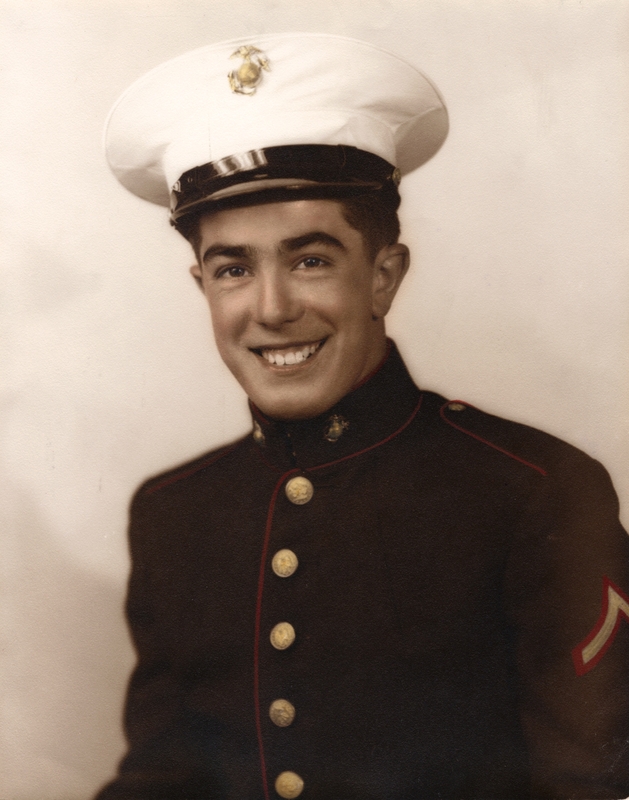 James served as a Message Center Man with the Headquarters and Service (H & S) Company, 28th Regiment of the 5th Marine Division. He and his unit went ashore in Iwo Jima on February 19, 1945 at approximately 0935 as the 8th wave which was 35 minutes after the initial landing. James was part of a communications unit of about 20 men. He regularly worked with the Navajo “code talkers”, Frank Toledo in particular. 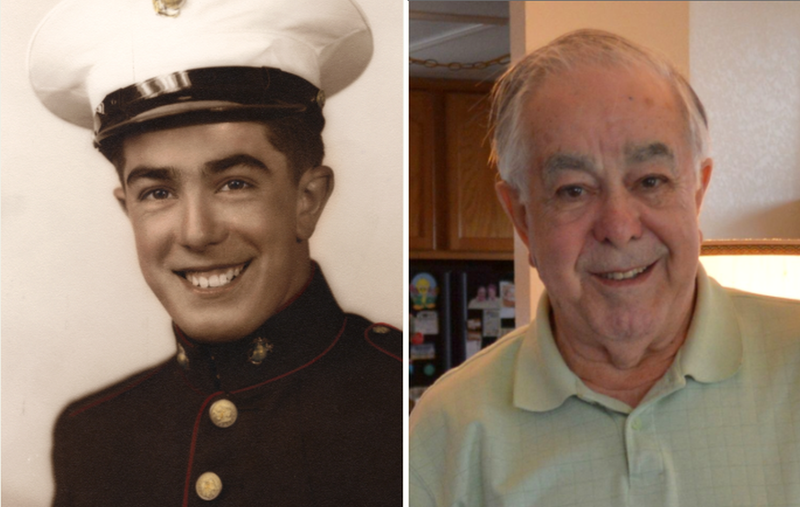 James was “one of the lucky ones” who survived 36 days of battle on Iwo Jima. He said that it really was a game of chance as to who lived and who died. On one occasion James left his fox hole as part of a mission and when he returned, the soldier that took his place had been killed and another soldier near the fox hole had his arm almost completely severed. Another close call came when someone from James’ unit was required to go on a patrol. James said that straws were drawn, and the one that drew the short one never returned from the mission. James said that these were just a couple of the many instances in which he was spared. James also shared with me that he was witness to the atrocities endured by Ralph “Iggy” Ignatowski. It is believed that Ralph was tortured to death on Iwo Jima. He was pulled into an underground cave and endured three days of slow torture. His body was tossed out and found by his buddies on March 8, 1945. James was present as a photographer was documenting the evidence. James was later part of the occupation of Japan from September 22, 1945 through May, 1946. Jim and his unit were the first of the occupation forces to arrive in Japan. He was in Japan for 8 months. James is also quoted in the book The Lions of Iwo Jima. Medals and Honors: The American Campaign Medal, the WWII Victory Medal, the Good Conduct Medal, the Presidential Unit Citation, the Asiatic-Pacific Theater with one Battle Star and the Army of Occupation Medal. 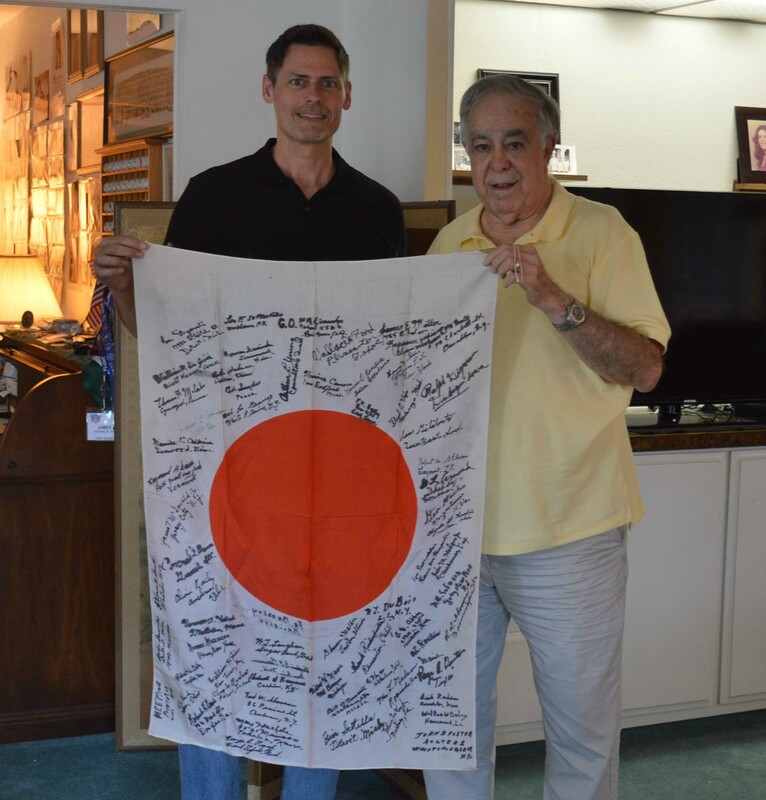 James and I holding the Japanese flag he removed from a dead Japanese soldier while in Iwo Jima. 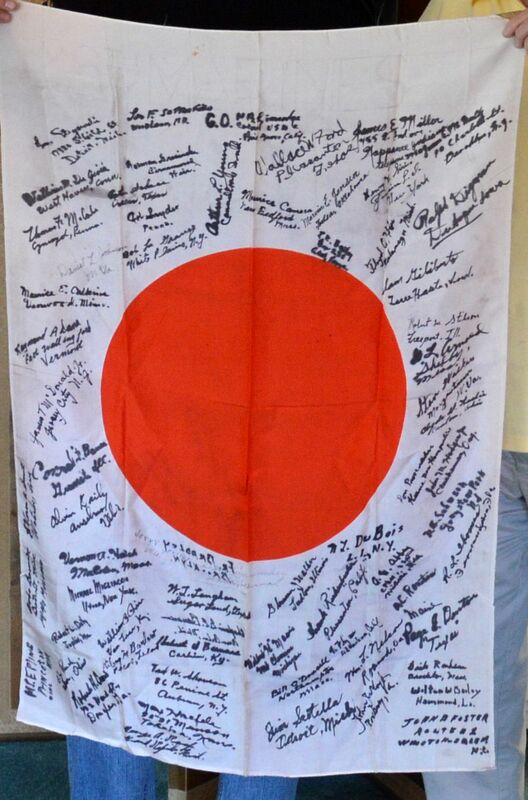 The flag was later signed by 67 members of James’ unit. Note: the top signature on the flag by “CO” is by Colonel Harry (the Horse) Liversedge, the commanding officer of the 28th Marines which was the Regiment that raised the flag on Iwo Jima. Colonel Liversedge is one of the most famous and respected Marines in history. By all accounts, the men of the 28th worshiped him. These two Navajo cousins, Private First Class Preston Toledo (left) and Private First Class Frank Toledo (right), were both Code Talkers. They served in a Marine Artillery Regiment in the South Pacific. James routinely worked with Frank Toledo during his service on Iwo Jima. Source: Defense Department photograph. Courtesy of National Archives. 127-GR-1375-7875. 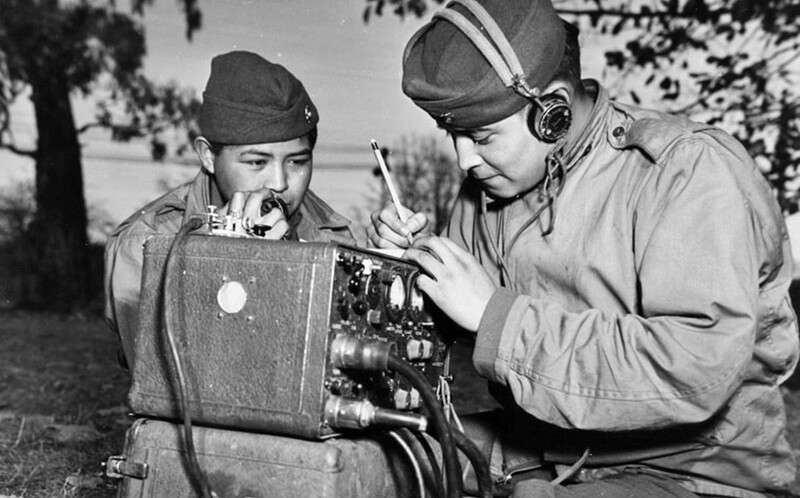 Select Gallery link at http://americanindian.si.edu/static/education/codetalkers. 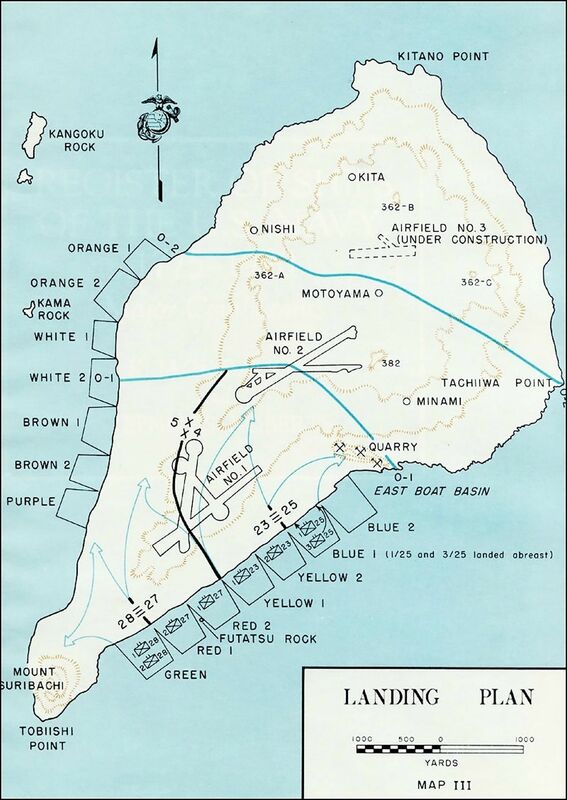 James landed on Iwo Jima’s Green Beach with the 28th regiment of the 5th Marines division. I asked James what he was thinking when he was on the Higgins boat heading for the shores of Iwo Jima. He said that, strangely, he wasn’t afraid and was just thinking about what he had to do when they went ashore. When James finally arrived on the shores of Green Beach, he said that he wondered why a particular Marine seemed attentive and was just hunkered down in a fox hole. It was shortly after this that James realized that the Marine was KIA. James said that it was at this point that everything became very real and the fear set in. It was the 28th regiment of the 5th Marines that took Mount Suribachi and participated in the famous U.S. flag raising. James witnessed the raising of both flags. The first was of a smaller flag and the second was a larger one. James said that the second raising wasn’t staged, but was done as a larger flag was desired. First (left) and second (right) raising of the U.S. flag atop Mount Suribachi, during the Battle of Iwo Jima. The first photograph was taken by SSgt. 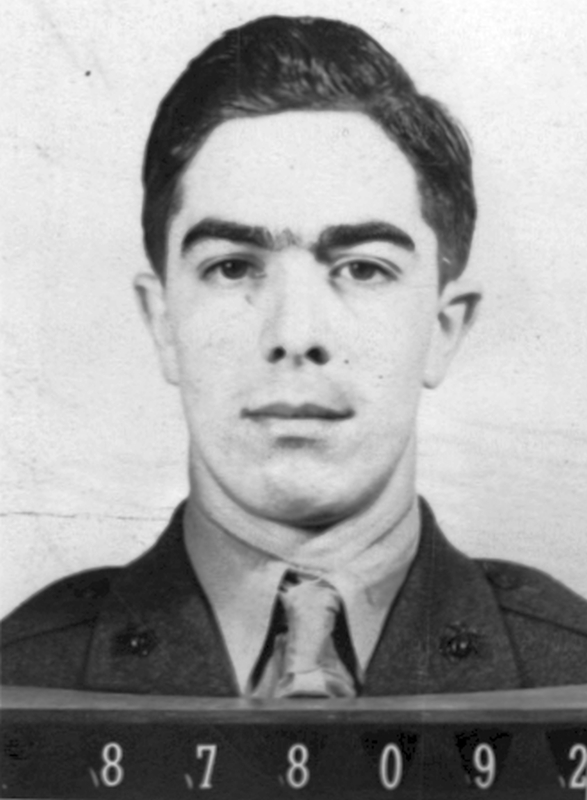 Louis R. Lowery, USMC and the second by Joseph John Rosenthal on February 23, 1945. Joseph Rosenthal received the Pulitzer Prize for this iconic photo. Three Marines depicted in the second photograph, Harlon Block, Franklin Sousley, and Michael Strank, were killed in action over the next few days. The three surviving flag-raisers were Marines Rene Gagnon and Ira Hayes, and sailor John Bradley, who became celebrities after their identifications in the photograph. It was the raising of this [first] flag that led the then Secretary of the Navy, James Forrestal, to comment that “…the raising of that flag on Suribachi means a Marine Corps for the next five hundred years”. Fearing that the flag would be taken by higher-ups, Lt Col Chandler Johnson, commander, 2/28 ordered a second patrol to the top of the mountain to replace the flag with a larger one that could later be given to any senior ranking personnel that wanted it as he intended for the first flag to remain with the battalion. 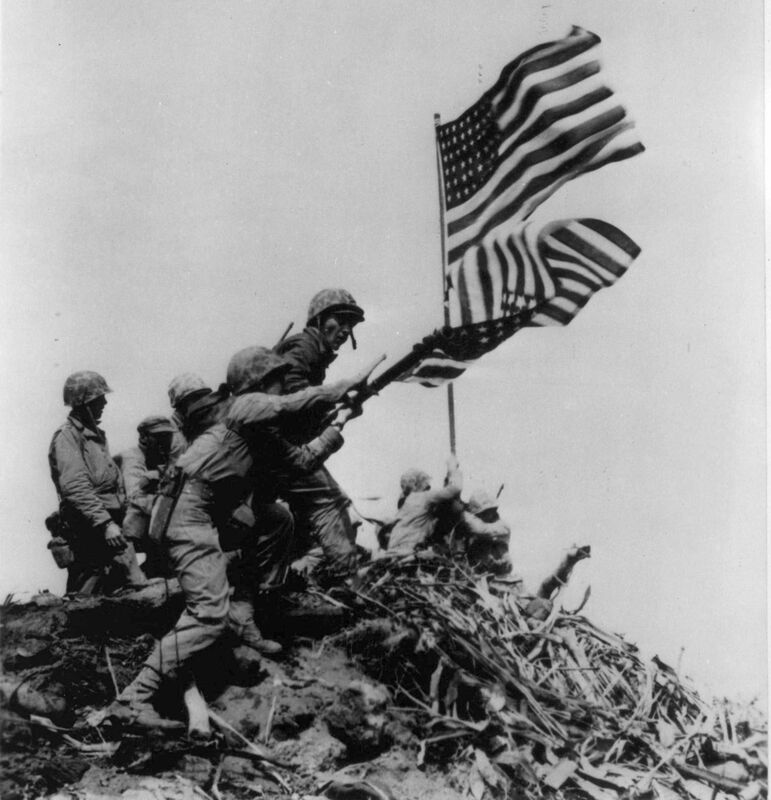 It was the raising of this second flag that was caught on film by Joe Rosenthal and would become the iconic photo of the battle. The Attack Transport Missoula donated the smaller flag, raised by the Schrier Patrol on the summit. 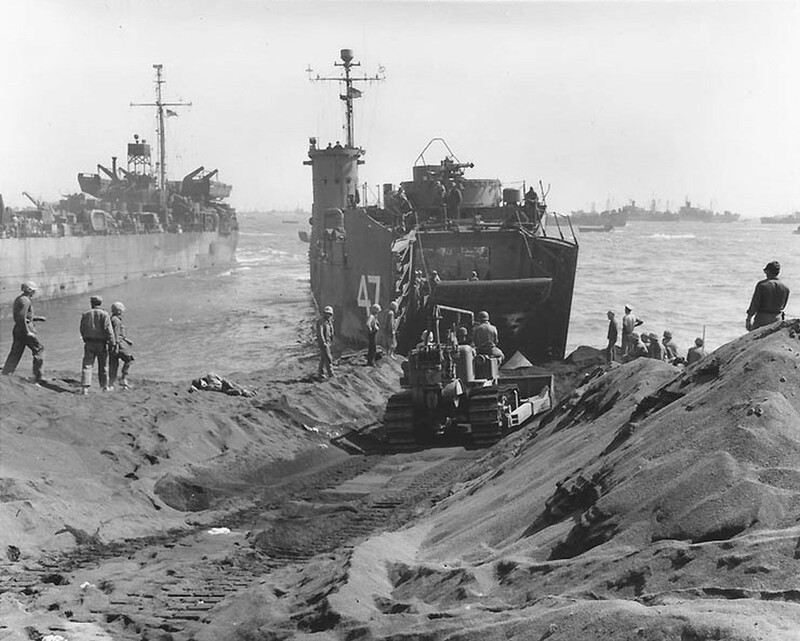 Landing Ship Tank (LST) 779, then unloading at Green Beach, donated the larger flag, raised later in the day and portrayed in the famed Joe Rosenthal’s photograph. Frayed by strong winds, the second flag flew from Suribachi for the balance of the battle for Iwo Jima. James was present at this dedication. He told me that it was a very sad moment for him and his unit and that people back home have no idea what a humbling experience something like this can be. He said, “I can never forget the guys we left behind”. 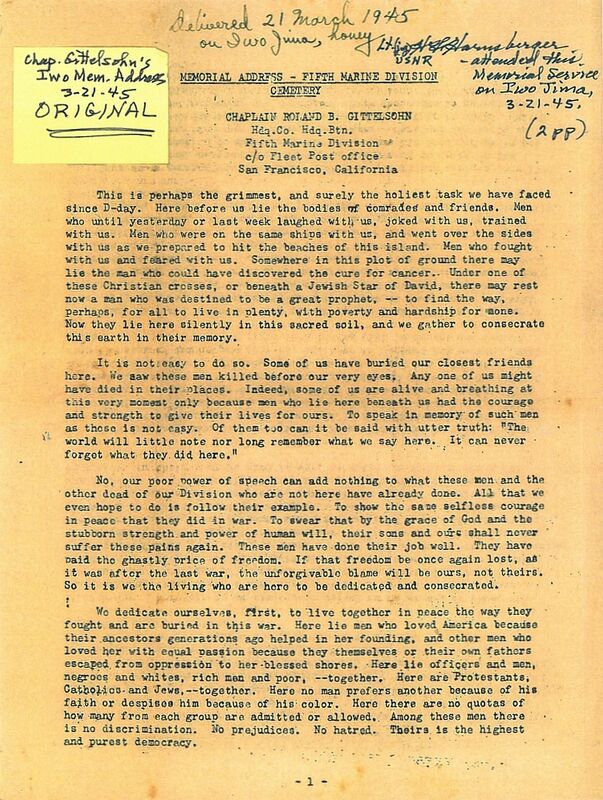 Page 1 of a copy of an original 5th Marine Division Cemetery Dedication address that was handed out to the troops at the 5th Marine Division Cemetery dedication on Iwo Jima, 3/21/1944. The address was read by Rabbi, Lieutenant Roland B. Gittelsohn, Chaplain Corps, USNR. Document courtesy of Steve Lopardo. 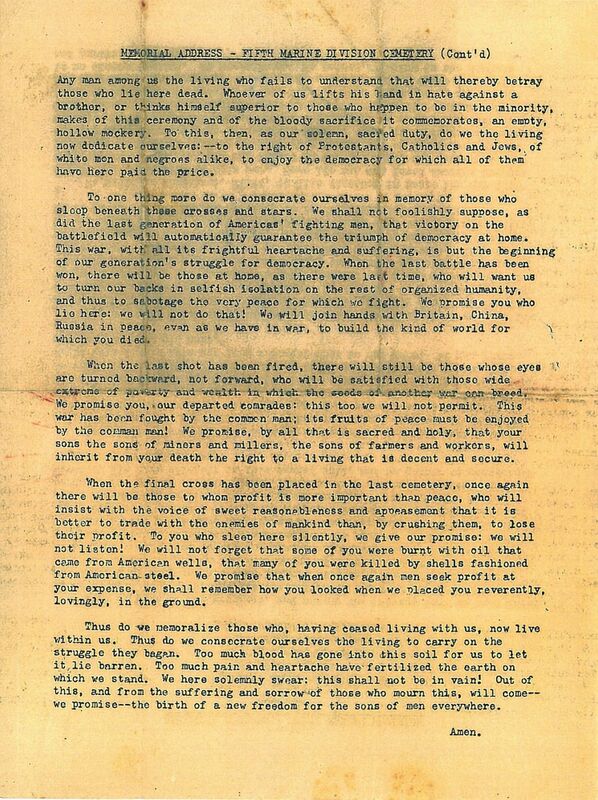 This is page 2 of a copy of an original 5th Marine Division Cemetery Dedication address that was handed out to the troops at the 5th Marine Division Cemetery dedication on Iwo Jima, 3/21/1944. The address was read by Rabbi, Lieutenant Roland B. Gittelsohn, Chaplain Corps, USNR. Document courtesy of Steve Lopardo. 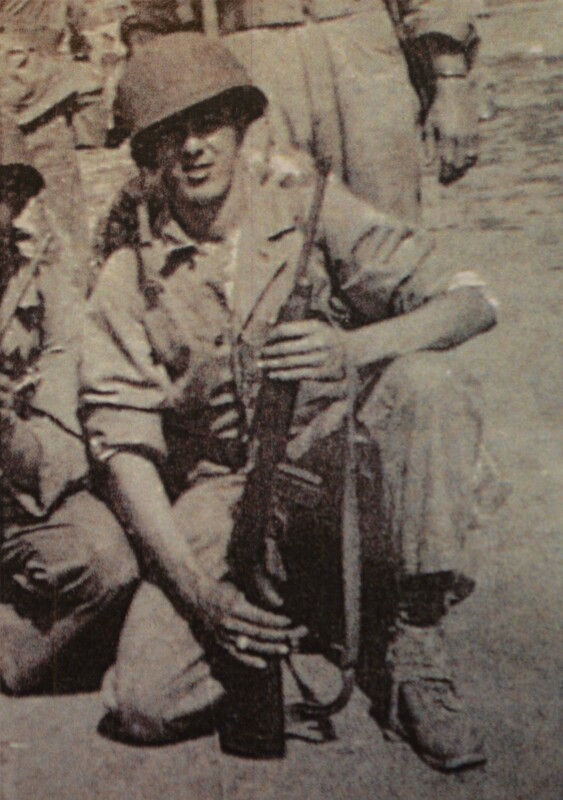 James with his M1 Carbine at Camp Pendleton, CA 1944. 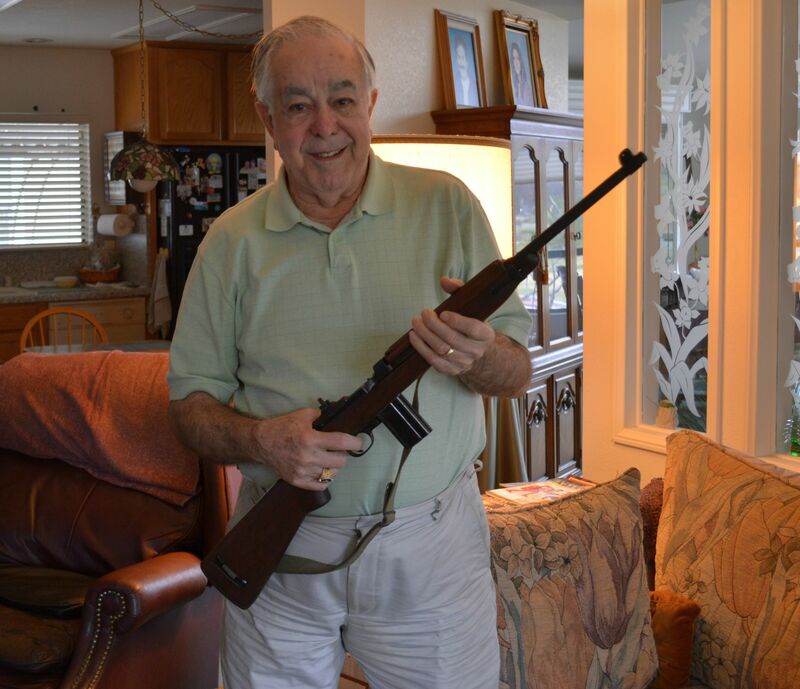 James with my “corrected” 1943 Inland M1 Carbine. James said that he used the M1 Carbine during his entire military service. 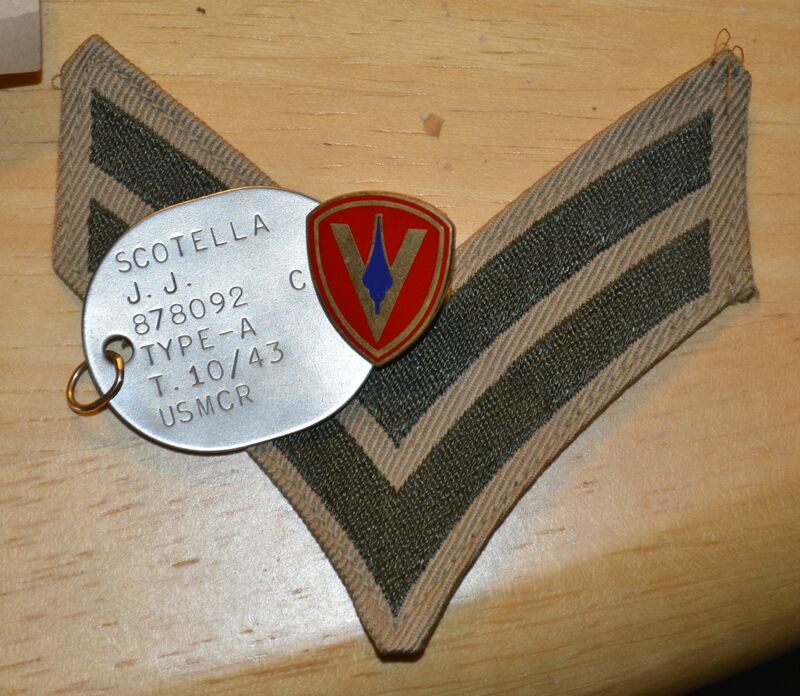 James’ military ID “dog tag” that he wore daily during WWII. The pin and stripes are representative of his rank and the 28th Marine Regiment respectively, but they were not used during his service. James Scotella interviewed by Hannah Mullins of ABC 10 San Diego regarding the proposed Iwo Jima monument at Camp Pendleton. James Scotella speaking about why he feels there should be an Iwo Jima monument on the west coast at Camp Pendleton. 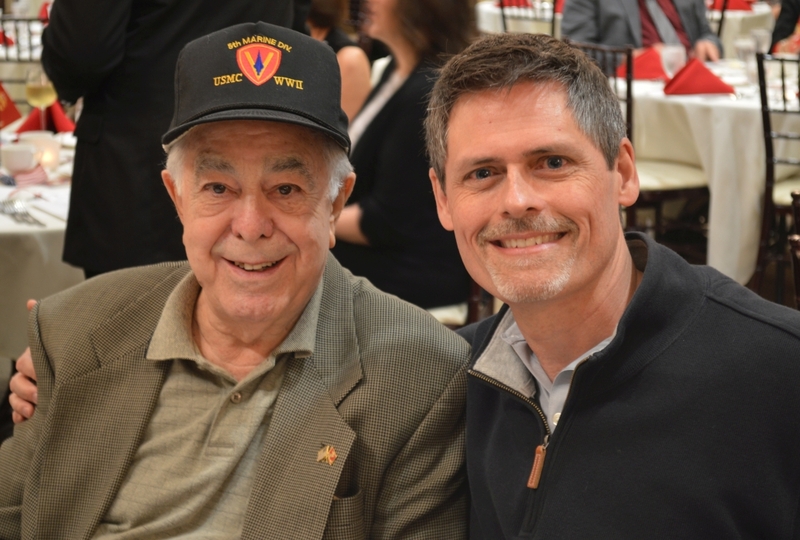 James Scotella and Brent Spencer at the 73rd Iwo Jima Memorial Banquet. James was born on May 15, 1925 in Detroit, Michigan. Keith, I will email you a copy of the MCRD San Diego platoon photo that James has. Do you know in which platoon your father trained at Camp Pendleton?